Life happens and occasionally we run into really tight situations with our money. Generally, we open retirement accounts with the intention of never touching that money again until it’s time to withdraw it for post-retirement expenses…but sometimes that’s not always the case. 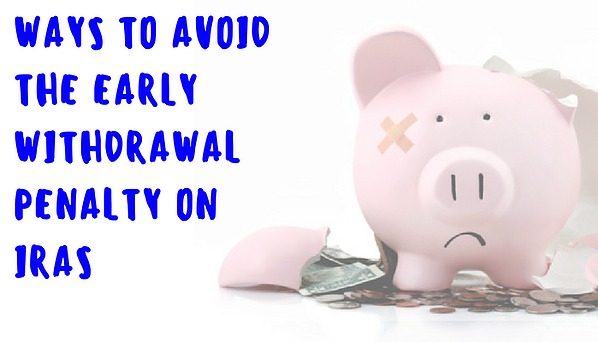 On top of paying income taxes on early distributions from retirement accounts, there is a 10% early withdrawal penalty designed to discourage investors from taking the money out prematurely. HOWEVER, there are some special circumstances that those with retirement accounts should know to make sure they don’t have to forfeit that 10% penalty. 1) Inherited IRA Funds – generally with all accounts, you are expected to list a beneficiary for the account in the form of a will substitute. At the time of the individual’s death, their beneficiary pay be paid the value of the inherited IRA (no matter what the age of the beneficiary is) as the time of the owner’s death. 2) Disability – if the owner of the Roth IRA becomes disabled, they can add to the social security payments by taking money out of their Roth IRA and avoiding the 10% penalty. Specific requirements for meeting the definition of disabled may be necessary to claim this benefit, but the Social Security office usually establishes these. 3) You Reach Age 59 1/2 – retirement usually happens much later in life than age 59, so this would be considered an early age to take a distribution. That being said, there is no penalty for individuals who decide to withdraw from retirement this early, just be sure that this money isn’t your only source of income in retirement (it needs to last a long time).